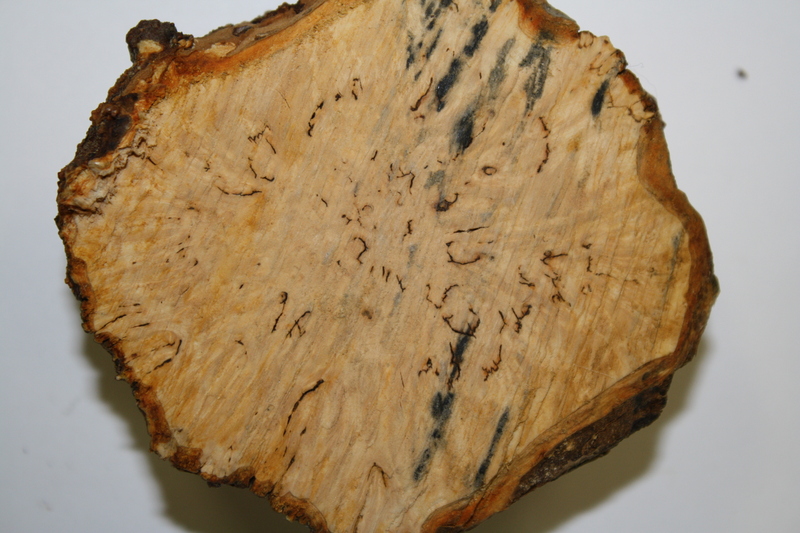 Trees and other woody plants often have large or interesting swellings on their trunks or branches. The cause is often difficult or impossible to determine. Possible causes include fungi, bacteria, insects, mechanical or environmental injury, or genetic mutation. The terms gall, tumor and burl are commonly applied to describe these abnormal swellings. 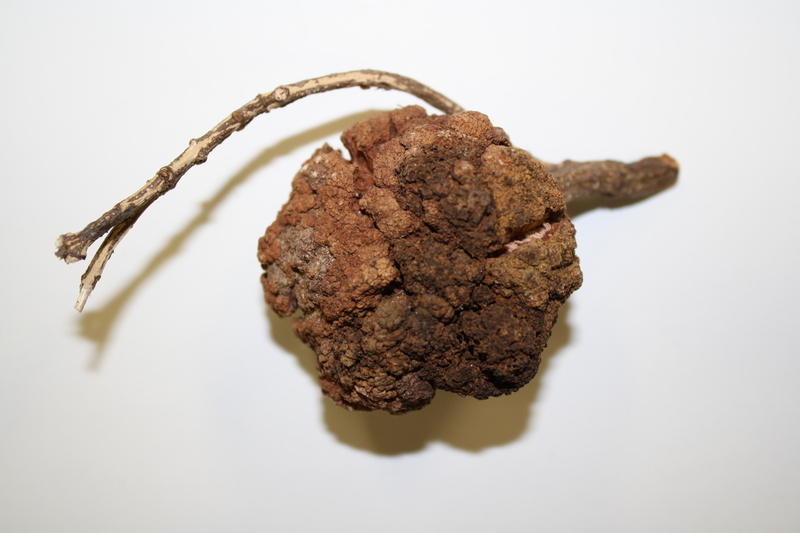 Galls and tumors can be any size or shape and may occur on both woody and herbaceous plants and plant parts. The swelling occurs as cells divide more rapidly than normal (hyperplasia) and/or due to excessive cell enlargement (hypertrophy). 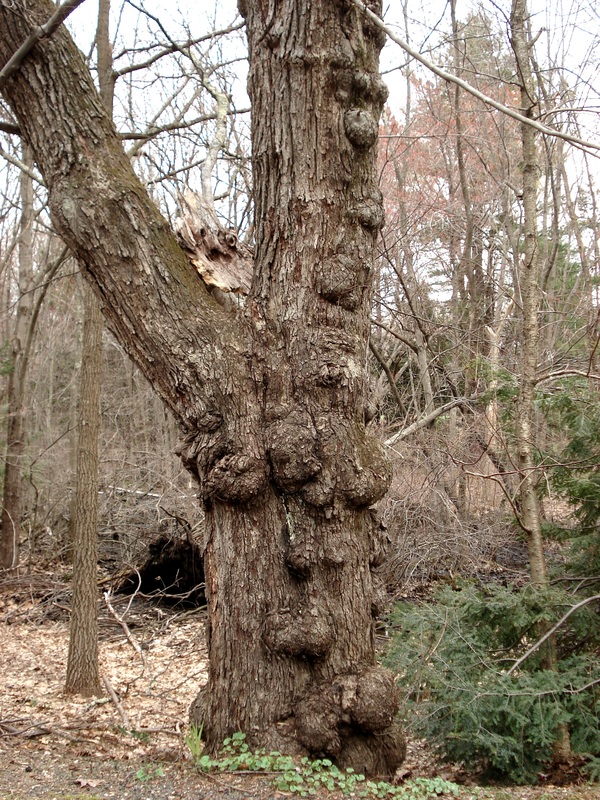 Burls are generally considered to be large woody swellings that are basically hemispherical in shape. They often bear many buds and sometimes sprouts. The burls of black walnut, coast redwood, sugar maple and black cherry are highly prized by woodworkers for their beautiful swirling or ‘bird’s eye’ grain. This relatively small burl from an apple tree (cause unknown) has an interesting surface pattern and interior grain showing bud traces. Burl from an apple tree trunk. Tiny brown lines are bud traces. An individual tree may have one or many swellings. On this maple tree, the many swellings are of unknown origin. Often, a tree with large or numerous galls will decline earlier than a tree without them. 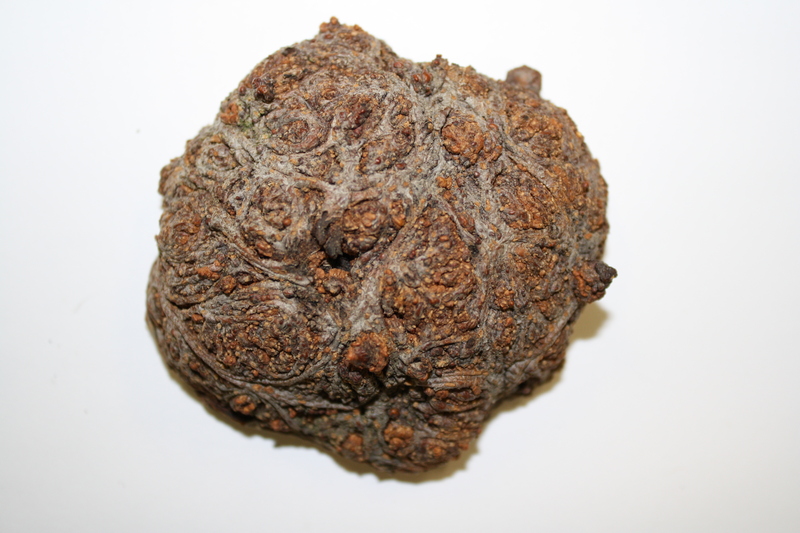 The most common bacterial gall disease is crown gall caused by the bacterium Agrobacterium tumefaciens. This soil-borne bacterium enters the roots of the host plant through wounds caused by planting, cultivation, frost heaving, insects or nematodes. The bacteria, upon attaching to the plant cell walls, send DNA that causes production of plant growth hormones into the plant cell where it is incorporated into the plant cell chromosome. Affected cells begin to multiply at an uncontrolled rate, resulting in visible tumors within 2-4 weeks. More than 600 plants are susceptible to crown gall. One of the most common, where galls occur on both roots and stems, is Euonymus, shown in the photo. 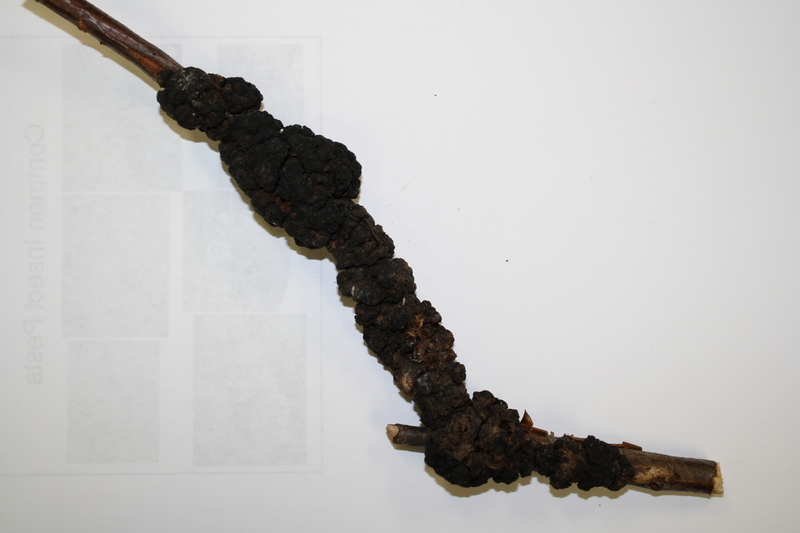 Examples of galls caused by fungi include azalea gall (Exobasidium vaccinii), black knot of plum and cherry (Apiosporina morbosa), and Fusiform rust of pine (Cronartium quercuum). More information on these diseases is available by clicking on the name of the disease. Black knot of plum and cherry. 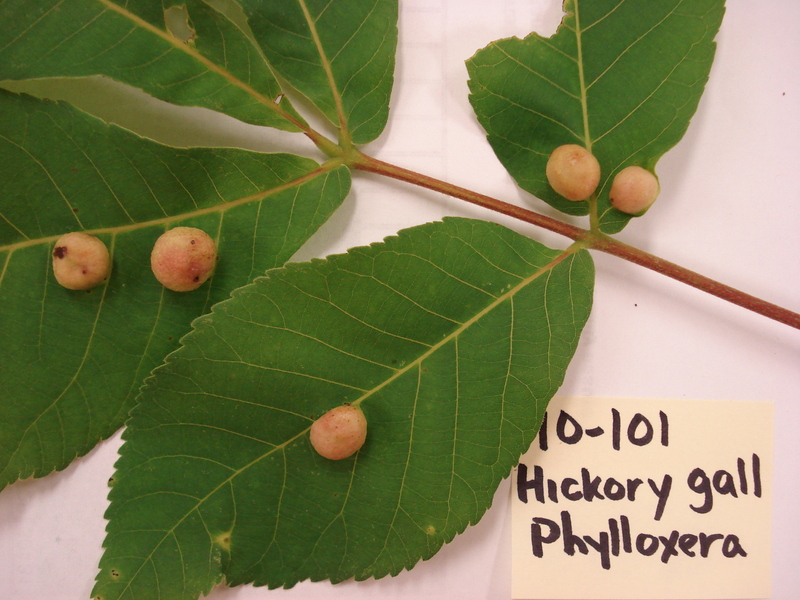 Insects and mites cause some very interesting galls on leaves as shown in the photo. These usually cause little damage to the host plant or tree and control measures are not normally recommended. A new theory is being explored by scientists that the swellings associated with these arthropods may in fact be caused by bacteria transferred to the plant tissue during feeding. Fascinating! Galls can be caused by cultural, mechanical and environmental factors including graft incompatibility, wounding, and freeze injury. Galls on some conifers that vary from small to huge (several times wider than the trunk) are thought to originate when the trees are young seedlings from a single cell and enlarge for many years. Low temperature injury is suspected, but not proven, as the cause. Thank you Joan. I love galls! I found a 2—2.5 foot burl in the root crown of an evergreen tree. Don’t really know what to do with it now. Does it have any monetary value? ?